These beautifully decorated units are fully furnished with the amenities of home, only raised in the air capturing the most breathtaking views possible . Each offering a different floor plan, varied elevation and décor design, choosing your favorite will be difficult. You will be spoiled by viewing popular beaches, vast open water, spectacular sunsets, city lights and night stars. Nature is literally at your fingertips. Don't pass up this unique adventure. With this easy stress free getaway, the only inconvenience of staying.....is having to leave. 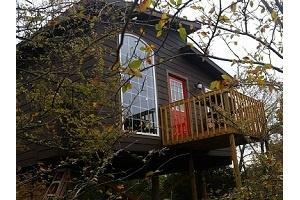 Constructed amongst mature trees, this elevated 1 bedroom unit accommodates up to 6 people. 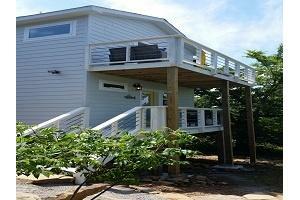 An over sized deck provides additional outdoor living space while enjoying the lake view. Standing tall, this fabulous unit is the perfect fit for one couple. 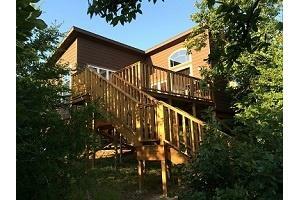 The main living area staircases to the loft bedroom with patio door and balcony overlooking the lake. This one of a kind, two bedroom cabin, offers privacy as well as a generous kitchen/ living entertainment area- comfortable for up to 6 people. 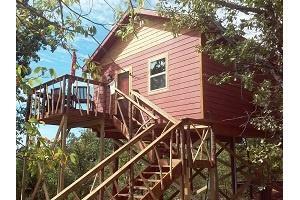 15 feet above ground and designed for 2 adults, this treehouse offers pine and cedar finishes, topped with vaulted ceiling. Large bay windows in living area and bedroom provide panoramic view. Check Out - by 11:00 a.m. Early arrival is permitted with prior approval. Pets are permitted with appropriate fee and must be accompanied by guest on grounds. Cancelation Policy: If cancelled 30 days or more prior to arrival: Full refund. Red, Orange, and Yellow Rentals: if cancelled 15-29 days prior: $50 cancellation fee, 14 or less: $100 cancellation fee. Turquoise Rental: if cancelled 15-29 days prior: $60 cancellation fee, 14 or less: $120 cancellation fee. 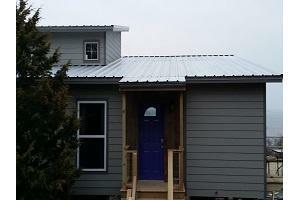 Purple Rental: if cancelled 15-29 days prior: $75 cancellation fee, 14 or less: $150 cancellation fee.